Born in New Orleans, Louisiana, as the second son to the late Frederick and Ora Mae Jones, Kirk Byron Jones is a graduate of Loyola University and Andover Newton Theological School and holds a Doctor of Ministry degree from Emory University and a Doctor of Philosophy degree from Drew University. Dr. Jones began preaching at age 12 and has served as a pastor for over thirty years. He was the founding minister of Beacon Light Baptist Church in New Orleans, and Senior Minister at Calvary Baptist Church, Chester, PA; Ebenezer Baptist Church, Boston, MA; and the First Baptist Churches of Randolph and Tewksbury MA. 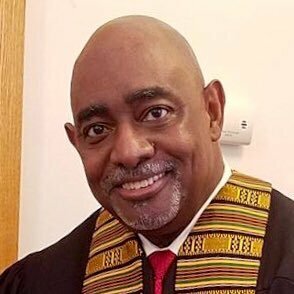 He presently serves as Senior Pastor of Zion Baptist Church in Lynn, Massachusetts. Throughout his pastoral ministry, Rev. Jones has served on various religious and civic committees at the local and national level. A professor for over twenty-five years, Dr. Jones has served as Director of the Kelsey-Owens Black Ministries Program and Kelsey-Owens Professor at Andover Newton Theological School. Currently an adjunct professor of social ethics, preaching, and pastoral ministry at Andover Newton Theological School, Dr. Jones serves as guest preacher and teacher at churches, schools and conferences throughout the United States. His writings have been published in various journals, including The Christian Century, Leadership, Gospel Today, Pulpit Digest, and The African American Pulpit, a quarterly preaching journal he co-founded in 1997. Dr. Jones is the creator/author of the Facebook page "Yes to Grace" where he offers brief inspirational messages in words and images. Currently, "Yes to Grace” has nearly 200,000 subscribers. For more information about his writing and teaching ministry, you may visit www.kirkbjones.com. Dr. Jones is married to Mary Brown-Jones. They have 4 adult children, 3 grandchildren, and reside in Randolph, MA. When not engaged in the holy play of his labor, he enjoys leisurely fun, most especially: reading, journaling, listening to and learning about jazz, playing video games, and beholding sunsets. Registration is closed. Contact Joyce King if you need assistance 800-492-2525.